Intrahepatic vascular shunts are common; all intrahepatic vessels are associated with the formation of shunts. These include arterioportal (AP), portosystemic and arteriosystemic venous shunts. Rarely, systemic venous (i.e. hepatic vein to hepatic vein) shunts and portal-to-portal communications are seen . The unique dual blood supply of the liver (approximately 75% portal venous and 25% arterial) means there is a compensatory relationship between the two sources. When vascular compromise occurs, it causes a macroscopic opening of the shunts between the hepatic arteries, the portal veins and the hepatic veins through physiological anastomoses, which become abnormally enlarged [1-3]. In the fifth week of intrauterine life, there are three major paired veins in the abdomen: the vitelline or omphalomesenteric veins, the umbilical veins and the cardinal veins. The vitelline veins form the hepatic sinusoids. The left vitelline vein subsequently involutes and the blood is diverted into the right vitelline vein, which enlarges and forms the hepatocardiac portion of the inferior vena cava (IVC). Derivatives of the vitelline veins also form the hepatic and portal vein. The entire right umbilical vein and a portion of the left umbilical vein also degenerate. The persistent portion of the left umbilical vein connects to the right vitelline vein via the ductus venosus (Figure 1). The hepatic artery arises from the aorta and follows the mesentery [4,5]. In antenatal circulation, oxygenated blood from the placenta returns to the foetus via the umbilical vein and flows through the ductus venosus into the IVC (Figure 2a). At birth, there is functional closure of the umbilical arteries, veins and the ductus venosus. Following atrophy, these form the medial umbilical ligaments, the ligamentum teres and the ligamentum venosum, respectively. 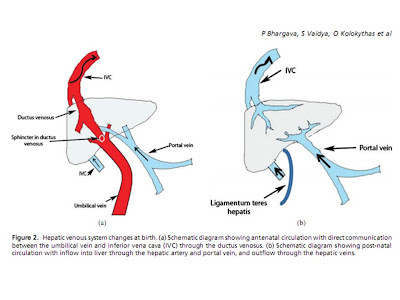 Post-natal anatomy consists of inflow into the liver through the hepatic artery and portal vein, with the outflow through the hepatic veins (Figure 2b) . 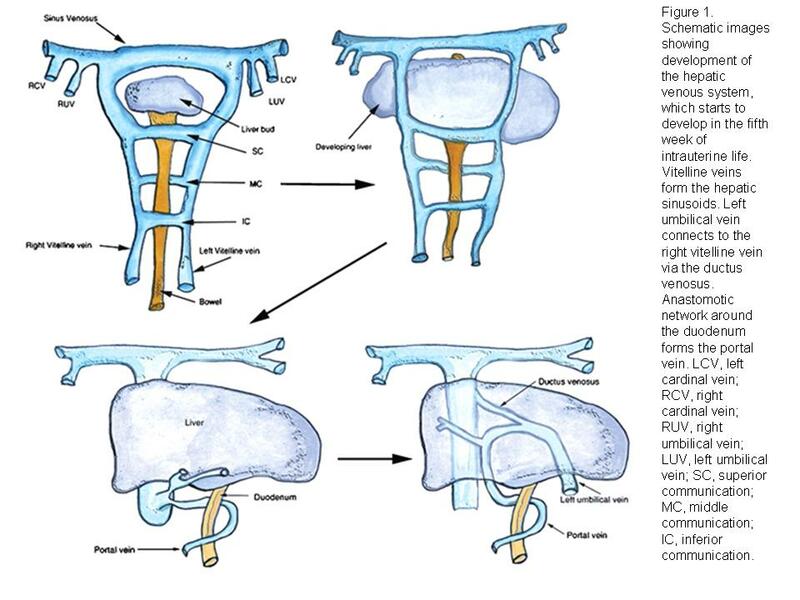 There is potential for intrahepatic shunts to develop when the ductus venosus remains patent, from failure of right upper vitelline vein regression, from a varix of the portal vein connecting to the hepatic/systemic venous circulation, from focal persistence of the most superior aspect of the vitelline veins or from arteriovenous malformations or neoplasms [6,7]. The hepatic vascular shunts can be divided into AP, portosystemic, arteriosystemic, systemic-venous, and portal-to-portal shunts. 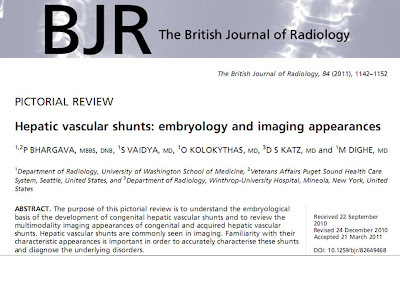 AP shunts are seen in congenital vascular malformations, including those identified in patients with hereditary haemorrhagic telangiectasia (HHT), as well as in benign and malignant hepatic neoplasms, cirrhosis, tumour thrombus and trauma. On colour Doppler imaging, these shunts display high-velocity, low-resistance arterial waveforms with arterialised portal venous flow. HHT, or Osler-Weber-Rendu (OWR) syndrome, is an autosomal dominant disorder known to involve virtually every organ of the body, with hepatic involvement in 8–31% of cases. Hepatic manifestations include AP shunts (Figure 3), arteriosystemic shunts (most common type), portovenous shunts, telangiectases, large confluent vascular masses, perfusion abnormalities, fibrosis and cirrhosis [9,10]. Patients with symptomatic liver disease (high-output liver failure or portal hypertension) and atypical cirrhosis ultimately require transplantation . Among hepatic tumours, AP shunts are most commonly identified in patients with hepatocellular carcinoma (HCC). They are also commonly seen in cirrhosis, especially after a portocaval shunt operation [4,8]. These shunts are typically wedge-shaped, with or without internal linear branching structures in the arterial phase, and are iso- to slightly hyperattenuating during the portal venous phase. However, a follow-up radiological study may be required to exclude the possibility of a coexistent tumour . Tumour thrombi are seen most commonly in patients with HCC (Figure 4) and to a lesser extent in patients with cholangiocarcinoma or metastases, and also cause AP shunting. Trauma-related AP shunts may occur secondary to penetrating trauma, and can be caused by a liver biopsy (Figure 5) or by percutaneous biliary catheterisation. 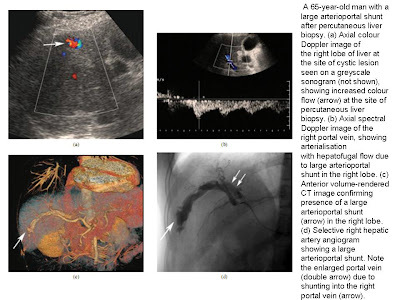 Radiological imaging-guided intervention, such as embolisation, is performed if there is rapid development of life-threatening portal hypertension or high-output cardiac failure. If embolisation fails, surgery is often necessary [2,8]. Portosystemic venous (PV) shunts are relatively rare, and are seen between a portal venous branch and a hepatic vein or the IVC. 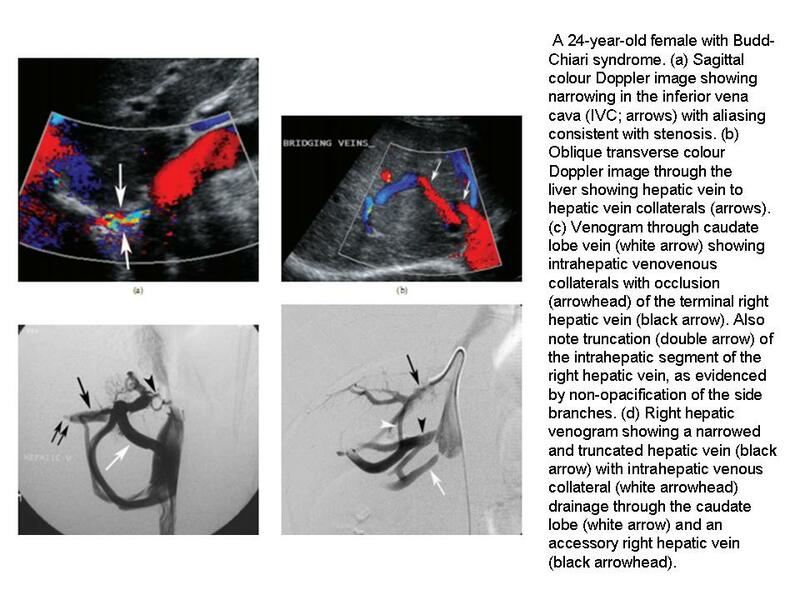 Postulated congenital causes include persistence of a communication between the vitelline veins and the right horn of the sinus venosus or rupture of a portal vein aneurysm into a hepatic vein [4,12,13]. Park et al  have described four morphological types of portosystemic shunts. Type I shunt, the most common type, is a single large shunt connecting the right portal vein to the IVC (Figure 6). Type II shunt is either single or multiple, and communicates between the portal and hepatic veins in one hepatic segment (Figure 7). 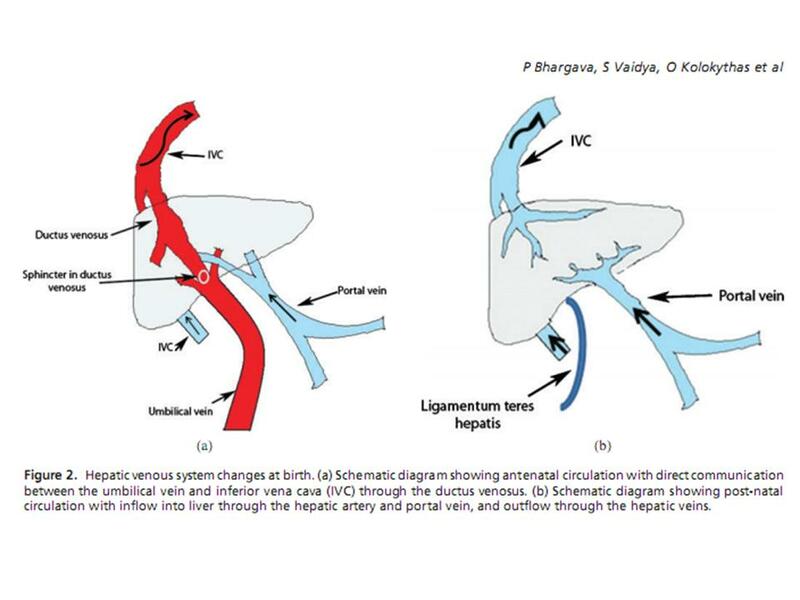 Type III shunt is a small connection between a peripheral portal and hepatic vein through an aneurismal varix (Figure 8). Type IV shunts are multiple communications between the peripheral portal and hepatic veins, and are seen diffusely in both lobes (Figure 9). 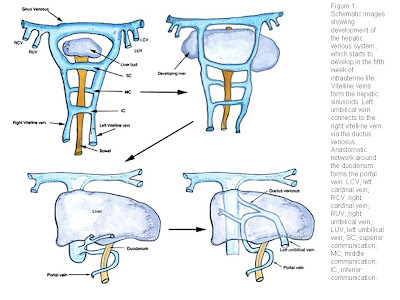 A patent ductus venosum connecting the left portal vein to the IVC could be considered the fifth type of portosystemic shunt (Figure 10) . Embolisation or surgery is performed if the shunt is symptomatic. Acquired causes of PV shunts include portal hypertension with or without associated HCC, iatrogenic (from transjugular intrahepatic portosystemic shunt, TIPS; Figure 11), surgical portocaval shunt (Figure 12), surgical mesentericocaval shunt and trauma . 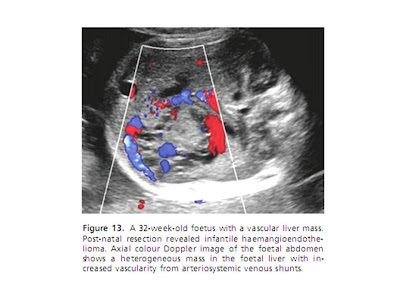 PV shunts appear as anechoic tubular cystic channels on greyscale sonography, with a pulsatile spectral Doppler waveform in the portal and splenic veins [4,15]. CT and MRI can confirm the diagnosis . Arteriosystemic venous (AV) shunts are communications between the hepatic artery and the hepatic veins. These can be seen in vascular malformations such as HHT, as well as in benign and malignant liver lesions including infantile haemangioendothelioma, haemangioma and HCC . Infantile haemangioendothelioma (Figure 13) usually manifests clinically before 6 months of age with high-output congestive failure, hepatomegaly, anaemia, thrombocytopenia, respiratory distress, haemorrhage or jaundice. Haemangiomas in the skin and associated organs (haemangiomatosis) are also commonly identified. When AV shunting is present, high-peak Doppler shifts and a low resistive index in the feeding arteries may be seen, as well as hyperpulsatility of the portal vein and a pulsatile pattern in the draining veins. There is also aortic tapering at the branching point of the coeliac artery. Asymptomatic patients are closely followed up without treatment. Standard treatment for infantile haemangioendothelioma is corticosteroids. If there is no clinical improvement, interferon treatment should be attempted. Embolisation or surgery is reserved for patients in whom congestive heart failure remains even after a reasonable trial of medical therapy. Chemotherapy and radiation therapy have also been used . Systemic-to-systemic shunts are more often seen in patients with chronic hepatic venous congestion or Budd-Chiari syndrome. 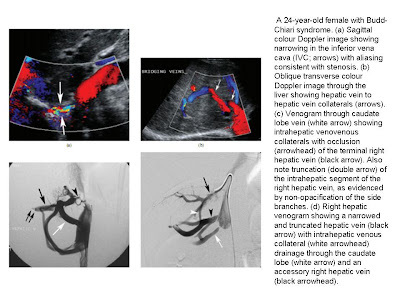 When Budd-Chiari syndrome occurs, there is obstruction of the hepatic venous outflow in the absence of right heart failure or constrictive pericarditis, and patients present with hepatomegaly, ascites and abdominal pain. 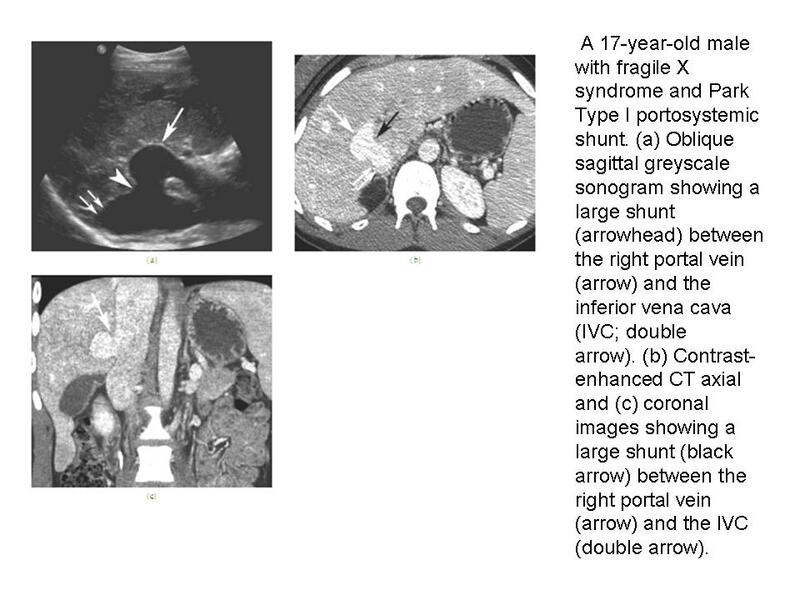 Hepatic venous shunts (Figure 14) are a specific diagnostic criterion for the diagnosis. These are either intrahepatic, which communicate with systemic vessels via subcapsular collaterals, or from an occluded hepatic vein to a non-occluded hepatic vein or to the caudate lobe veins. Rarely, shunts are seen from the hepatic veins to the suprahepatic IVC close to the right atrium. Therapeutic interventions include thrombolytic therapy, angioplasty with or without stenting, TIPS, surgical shunting and liver transplantation . Systemic-to-systemic venous shunts have also been identified in patients with HHT, and in HCC following tumour extension into the hepatic veins . Intrahepatic portal-to-portal venous (PPV) shunts are rare, but may be seen in cirrhosis. Recognition of these shunts is important as they can mimic HCC . 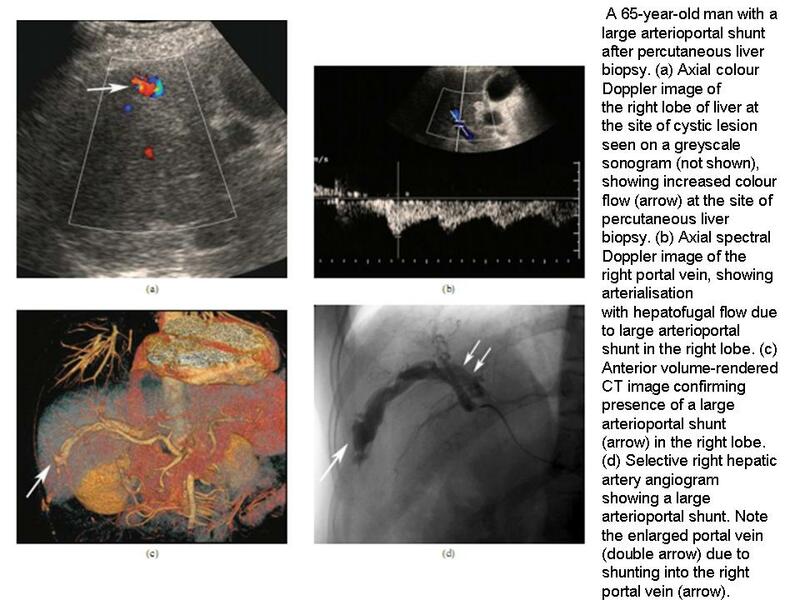 Extrahepatic PPV collaterals (Figure 15) and portal vein cavernomas are commonly seen with portal vein thrombosis . 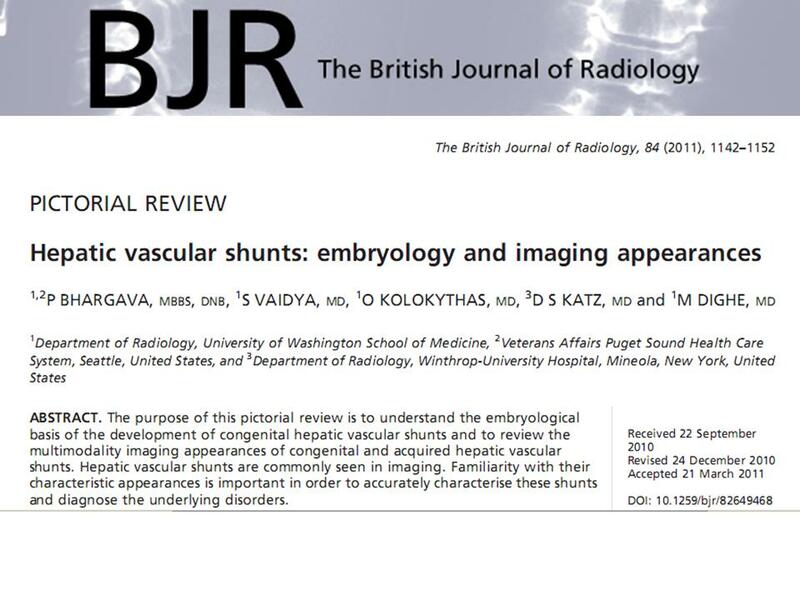 Congenital and acquired hepatic vascular shunts are frequently seen on cross-sectional imaging examinations, particularly on sonography and MDCT. 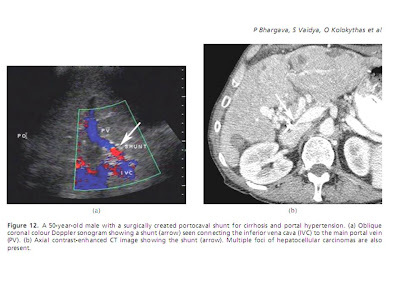 Awareness of the various types of hepatic vascular shunts can assist the radiologist in establishing an accurate diagnosis and in guiding appropriate patient management.